In culinary news, Friendly’s — they of the cheerful, old-timey, soda shop decor — apparently knows when they’ve had the gauntlet thrown down in front of them. Oh sure, they come at you with their whole “Where ice cream makes the meal” happy faces, and their quaint uniforms, but on the inside these are killer business people. They know when it’s time to up the ante. A while back, I told you about Kentucky Fried Chicken’s infamous Double Down Sandwich. At the time, I was so shocked by the incredible grossness of the ingredients that I am told I was a bit unfair to the restaurant chain by inferring that KFC was plotting to murder their customer base and steal their estates (“… if you wouldn’t mind just signing this Power of Attorney form before you eat your delicious Double Down, sir, and by the way, would you like fries with that?”), which, of course, was not at all my intention. But I am sometimes pretty often always willing to admit when I might have offended someone, even a large, faceless corporation with unlimited legal resources, so in order to avoid being sued make amends, I will just say that the introduction of the Double Down sandwich was clearly a totally humorous and fun prank on the part of KFC Corporate (“Ha ha! Let’s see how long it takes them to notice that the bread is missing”) and leave it at that. But I imagine it was enough to get Friendly’s thinking. How could they top KFC’s creation? How to build a better sandwich, so to speak, one that would bring in the customers in this tough economy and make them feel like Friendly’s loves them, and wants them to be happy? Let’s take a look, shall we? Overall, I would have to say that OH MY GOD, ARE THEY INSANE??! THOSE ARE GRILLED CHEESE SANDWICHES! ON BOTH SIDES! 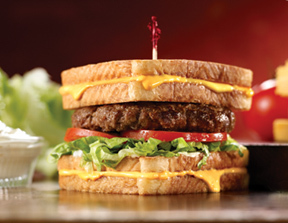 I think when our great-great grandchildren look back at this time, they will probably look at the remains of the Friendly’s Burger Melts and conclude that these were the instruments we used to off ourselves when things became too much. ← Yup. Now We're On Facebook. Look at the bright side, if you take this apart carefully you could feed a family of three. You have identified a trend. There will be no great-great grandchildren.